There’s no better way to truly explore the great outdoors than by living in it. Whether it’s a long weekend away or just a long day, hiking, exploring, and sleeping out under the stars lets you see Mother Nature in all her beauty. Spend the day rafting to each location? It’s an experience you’ll never forget. To make sure you are truly enjoying your time outdoors and not just desperately missing your DVR, it’s best to be properly prepared. A rafting trip without the essentials can be a bit of a nightmare. Long days in the sun can mean dehydration. Make sure that you have a canteen of water that is always easily accessible. Nothing makes you thirstier than looking at a lot of water you can’t drink. Also, pack some simple snacks such as protein bars, crackers, beef jerky, or something that doesn’t require to be kept cold or prepared. Most trips will have accommodations for all your major meals, so you just need enough to starve off any cravings while on the water. And, of course, don’t forget any alcohol you may want as well, just remember, out in the sun, you’ll want to pair that with even more water. SUNSCREEN. The sun reflecting off the water is no joke. Make sure that you apply it generously and continue to apply it throughout the day. And while you’re at it, don’t forget the bug repellent. A hat and sunglasses are also crucial to protect yourself from the sunlight. Make sure they are attached with a strap so they don’t end up in the water! Also, that string bikini may look great for the pool, but an additional layer is best to keep your skin protected. You can always peel it off later. Make sure to pack a good sturdy pair of water shoes. You will want additional dry clothes and shoes to change into once you get to camp. And don’t forget, everything needs to be packed into a small space and easy to carry – now is not the time to overpack and decide what you’ll wear later. Make sure you are prepared if you’re going to be making this an overnight trip or weekend getaway. You’ll need a sleeping bag and small pillow. You’ll also want all of your necessary toiletries. Remember, you’ll be spending your days on a raft. Save space by ditching the makeup, curling iron, and other unnecessary add-ons. Don’t forget an extra bag, a trash bag will do, to stash your wet clothes. That way you aren’t ruining the remainder of your weekend attire. Make sure you do include lotion and lip balm for all those extra hours in the sun. Also, baby wipes are useful to have for all kinds of messes. 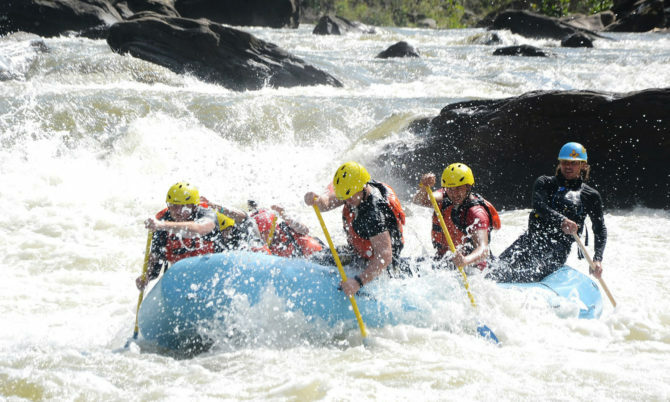 A rafting trip is an experience you’ll never forget. Try to make it memorable for the fun times, amazing sights, and unique experience, instead of the blistering sunburn, thousands of bug bites, and soggy shoes.